Jeffrey Curcio represents clients before the Examination, Appeals and Collection Divisions of the IRS. His primary emphasis is on income tax matters for all types of taxpayers, but he also is involved with planning and controversies concerning other federal and state tax matters. Jeff served as Managing Partner of the firm from 2002 through 2004. Jeff also has an active business practice, representing clients in many industries, including accounting, advertising, agriculture, architecture, consulting, construction, engineering, healthcare and law. His representation involves all phases of business counseling, including formation through dissolution of partnerships, limited liability companies, and corporations. He has extensive experience in contract negotiation and drafting, in such areas as employment, mergers and acquisitions, reorganizations, consulting and buy-sell agreements. 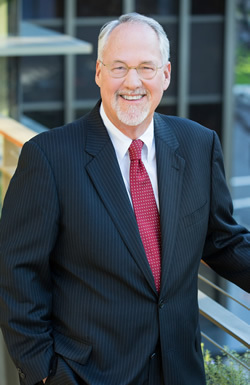 In addition to his active practice, Jeff is a member of the Sacramento County Bar Association's Tax Section, serving as Chair from 1991 - 1992. He is also a member of the Healthcare and Business Sections of the County Bar. Admitted to the California State Bar in 1982, he is also admitted to practice before the U.S. District Court for the Eastern District of California and the U.S. Tax Court. Jeff served as Adjunct Professor in the School of Taxation at Golden Gate University from 1987 through 2003, and has been recognized with an "Outstanding Faculty" award. He participated in the California Chamber of Commerce's statewide presentations on the California Limited Liability Company Act. Jeff has also been a seminar presenter for many tax and business programs. Jeff graduated from California State University at Hayward with a B.S. degree. He holds a J.D. from McGeorge School of Law, and an LL.M. in Taxation from Boston University. Jeff also attended Salzburg University and received a certificate in International Legal Studies and Jurisprudence. He is a member of the scholastic Traynor Society at McGeorge School of Law, and received The American Jurisprudence Awards for highest grades in the classes of Contracts and Business Associations. Jeff wrote for McGeorge's Pacific Law Journal, Volume 11. Jeff is an AV® Peer Review Rated attorney, the highest rating given by Martindale-Hubbell for legal ability and ethical standards. He was listed in Sacramento Magazine's 2018 Top Lawyers List. Jeff is a graduate of the “Leadership Sacramento” program of the Sacramento Metropolitan Chamber of Commerce. He has served on various boards, is a current member of the Sacramento Rotary, and is a “past-active” member of the Active 20-30 Club of Sacramento, a service to youth organization (“A man never stands so tall as when he kneels to help a child”).